To enable tire manufacturing plants to effectively use floor space and reduce cycle time, MicroPoise is introducing its in-line Modular Tire Measurement System, MTMS FX. It combines tire uniformity, dynamic balance measurement and geometry inspection into a single process. 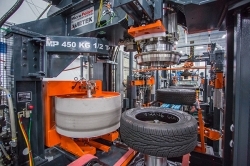 The system combines proven Micro-Poise machine modules and stations into a single process to efficiently provide customers with a large number of tire test results and functions. Possible tests include force variation as measured by the ASTEC FX tire evaluation center, dynamic imbalance measurements using the AkroDYNE FX dynamic balancer, and tire geometry checks using the TGIS Sheet of Light geometry measurement system.